It seems I've forgotten about Jamestown a lot recently. I'll either be shooting in South County or in Newport, but not very much on the island in between. 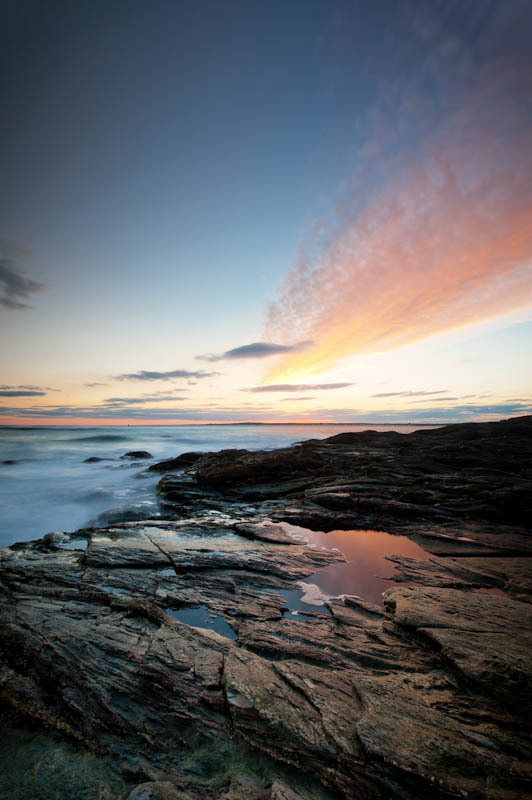 One of the greatest spots on the island is Beavertail Lighthouse, a popular stop for tourists, locals, photographers and the like. I remember going to Beavertail with the family when I was little to watch the storms blow in. 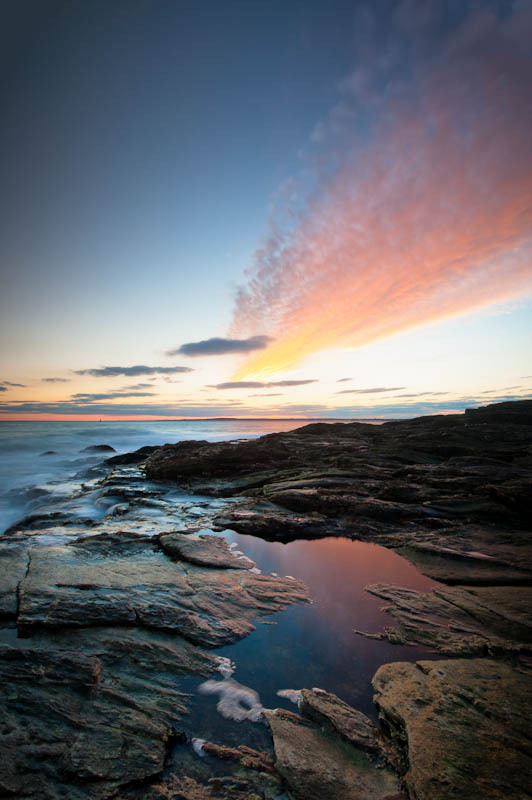 Last year I captured one of my favorite images during impending rainy weather at Beavertail (see previous blog posts for the awesome blue panoramic!). On this venture I was at Beavertail during low tide. The tide was still going to be receding about an hour while I was down there so I would be chasing the edge of the water for my entire shoot, not to mention the rocks would still be wet where I wanted to stand. Climbing down the rocks is especially hard bundled in winter garb, camera bag on your back, and tripod with camera attached clutched with both hands! But I made it down to a particularly flat section, carefully placing each step as the sun set and my surroundings became increasingly dark. The few wisps of cloud became underlit by the setting sun, creating brilliant shades of orange and pink. I had only a few minutes and came across a tidepool reflecting the pink hues. What I was hoping to capture was water breaking over the rocks (somewhere I could setup the camera and stand safely) with the sun backlighting the scene. But all the rocks facing the setting sun were piles and piles of wet rock with water just lapping meagerly at the base and nowhere for me to safely setup the camera. The tidepool would have to do! Now here's the two shots I chose from the entire shoot and I wanted to do something a little different with this post: a photo critique. I'm very torn between the two in choosing a favorite because of slight differences in composition. Both captured the color tones I wanted in the sky, blue water and pink clouds. Both captured the pink reflecting in the quiet pool. But there are elements that are different and equally appealing in both. Let's start with Image #1 on the left. When I was browsing through my shots, picking out the ones worth editing, I initially skimmed over #1's thumbnail for the simple reason of too little tidepool. 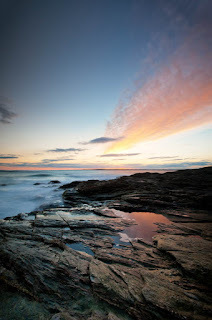 I was browsing for an image with more tidepool in the foreground, since that element was a main point of focus during the shoot. But when I blew it up to bigger than thumbnail size I was immediately captivated by the terrific detail and green tones in the rocks at the very bottom of the frame. It was an untended element that I really enjoyed the more I looked at it. Image #2: This composition more accurately captured what I was focusing on and shooting at the time. 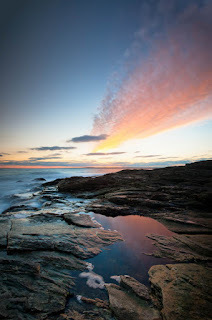 I was drawn by the tidepool reflecting the clouds both in shape and in color. Upon further review, however, it does not have the warmth or brightness I had hoped for, and there is less pink in the tidepool than I was looking to capture. But there is also a nice element happening between the tidepool and the edge of the ocean, where the water is receding off the rocks and reflecting bright blue tones that you can't find in Image #1. So which one do I like better? I really cannot say. After critical review they both had achievements and pitfalls with regard to my creative ambitions. Image #1 had the unintended foreground that I am really coming to enjoy, highlighting more of the rocks in the scene. Image #2 more accurately captures what I was seeing at the time, and is more about the tidepool and the water stretching from the foreground to the horizon. I'm still debating, but what are your thoughts?